I’ve been a lover of fresh fish since before I can remember. 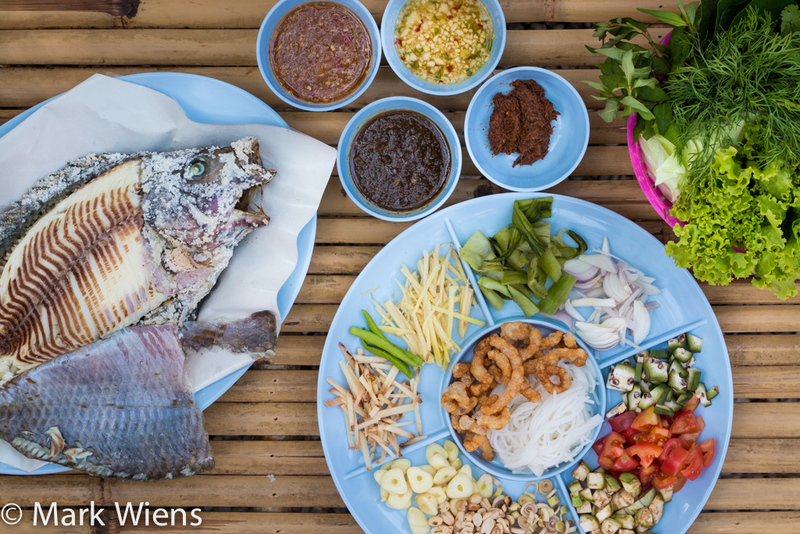 In Thailand, especially inland away from the ocean, one of the most popular fish to eat is pla nin, or tilapia. It’s farmed extensively throughout Thailand, and especially if it’s extremely fresh, it can be incredibly delicious. 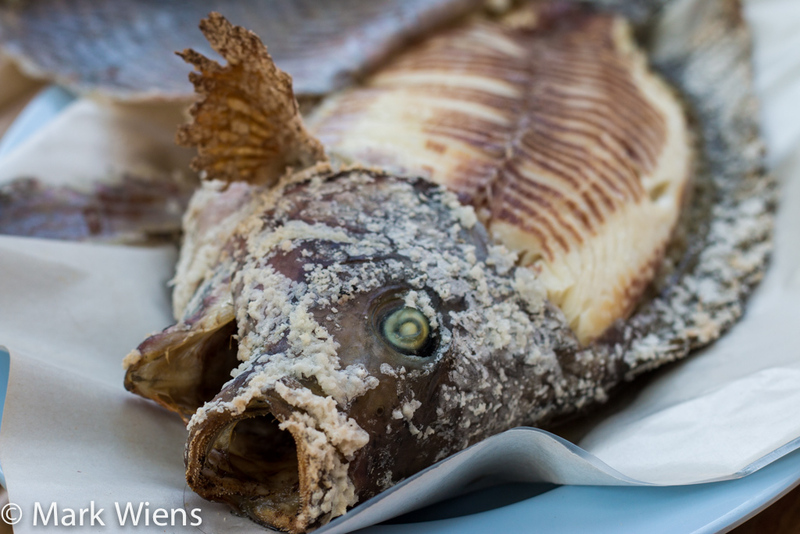 Probably the most common way throughout Thailand to eat pla nin, is roasted (you can check out my salt crusted grilled fish recipe here). Taking it one step further is a dish called miang pla pao (เมี่ยงปลาเผา), grilled fish combined with fresh herbs and rhizomes, all wrapped into leaf wrapper tacos. I had a chance to spend some time in Udon Thani, in the Isaan region of Thailand, and while I was there, I made sure to eat at Udon Miang Pla Pao (อุดร เมี่ยงปลาเผา), a restaurant that excels at serving extremely fresh grilled fish. The owner of Udon Miang Pla Pao (อุดร เมี่ยงปลาเผา) has family in Nong Khai, on the border of Laos, who own a fish farm, and that’s exactly where they get their fresh fish… and they transport it to their restaurant in Udon, still alive in tanks of water. 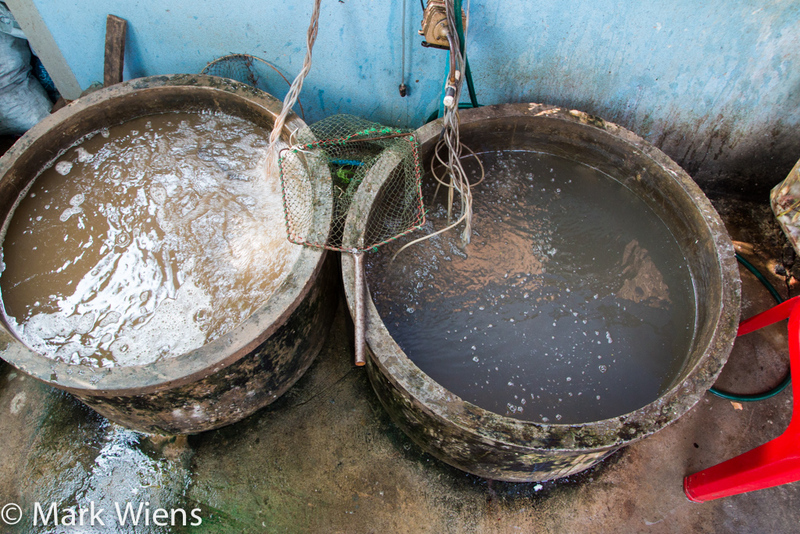 At the front of the restaurant you’ll see a couple of fresh tanks, where the fish are still alive and swimming. 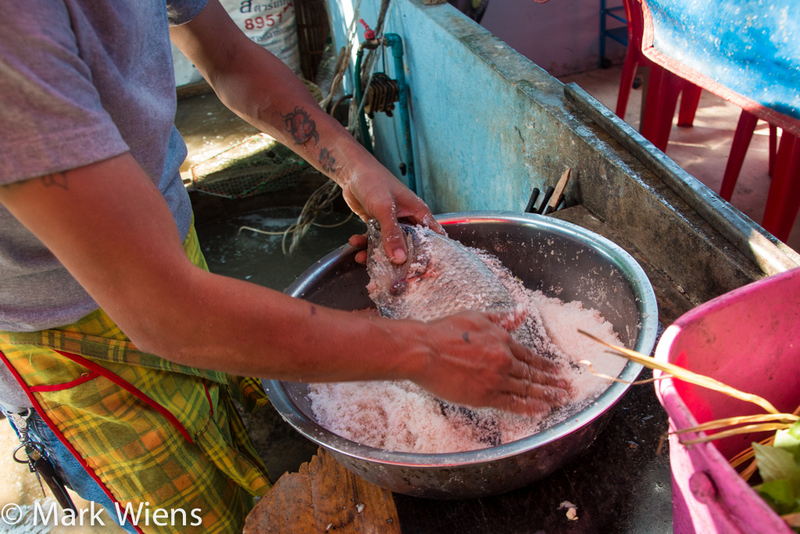 Literally, in just moments, the grill master grabs a fresh tilapia from the water, hits it on the head with a stick, pulls out the guts, stuffs it with pandan leaves and lemongrass, and rubs it in a thick coat of salt. He did it so quickly, I barely had enough time to take any photos! 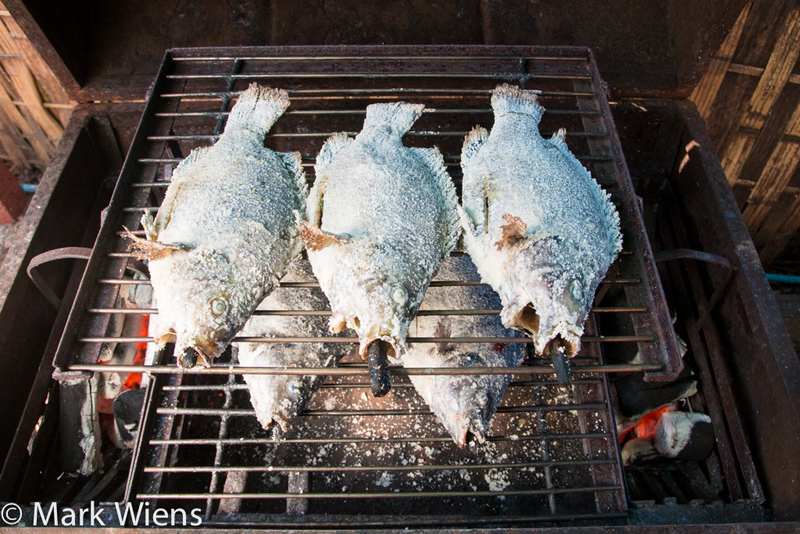 Literally within minutes from swimming around, the fish are fully prepared and beautifully sitting on the grill. 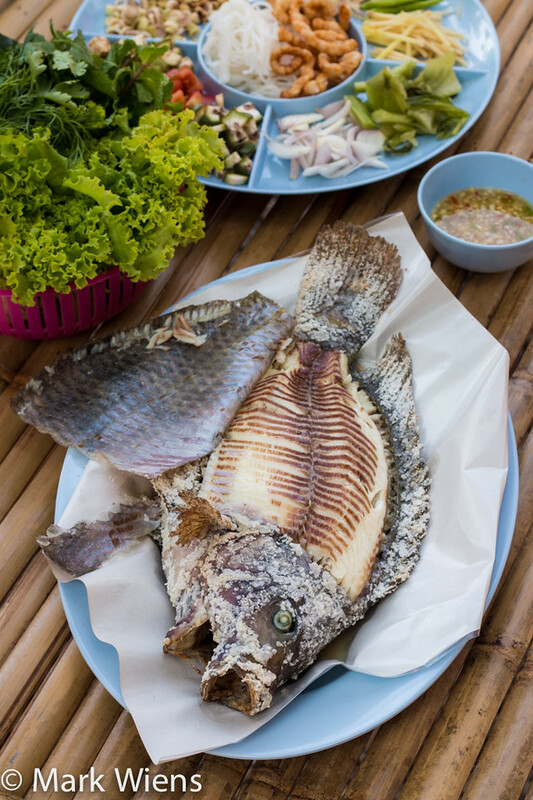 This is about as fresh as you can get grilled tilapia in Thailand. 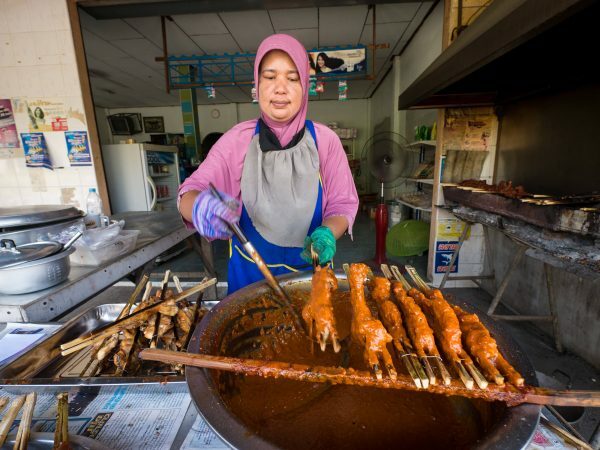 Rather than grilling the fish over direct, low heat charcoal, like what’s normally done in Thailand, at Udon Miang Pla Pao (อุดร เมี่ยงปลาเผา) they use a bit of an indirect grilling method, with hot coals on both sides of the barrel grill, and the fish are placed in the center. 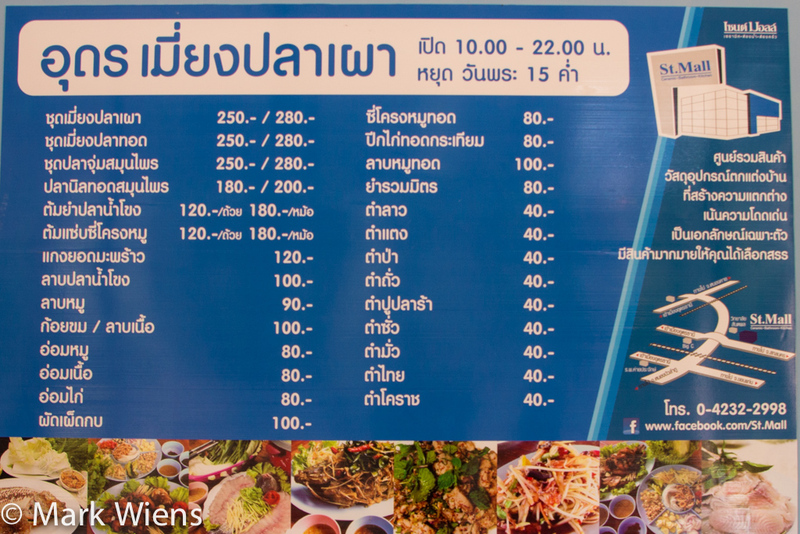 Here’s a shot of the full menu at the restaurant, and they do have a few options of different dishes (something I didn’t order was the Udon style hot pot called pla jum, but it’s available), but definitely their signature dish is the miang pla pao. 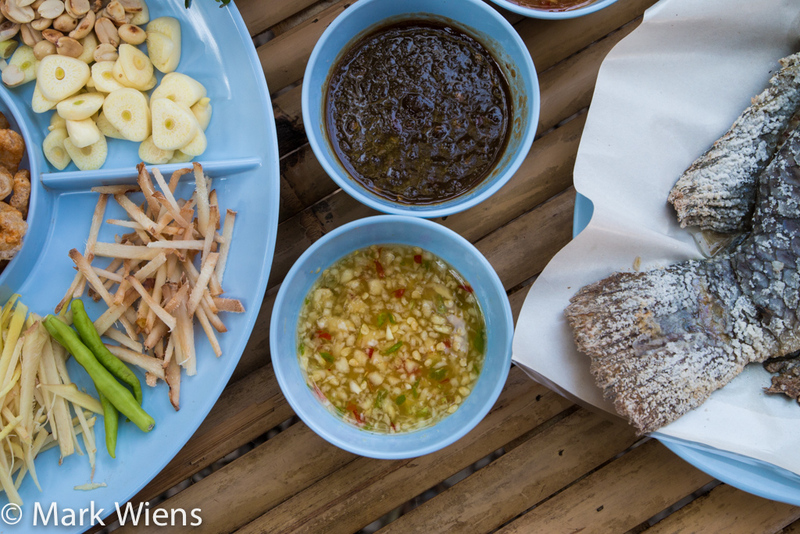 Miang is a word that refers to the method of eating food wrapped in leaves… you might have tried miang kham – the famous northern Thai snack of wild betel leaves filled with all sorts of diced ingredients. 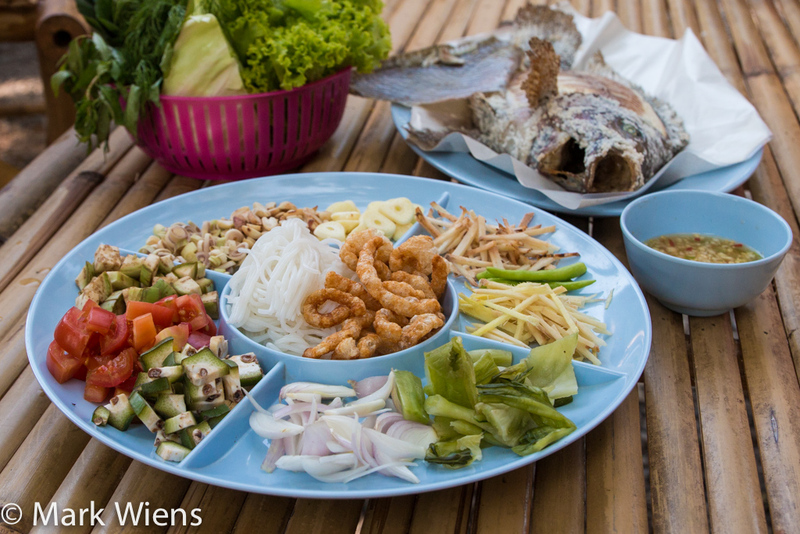 Miang pla pao (เมี่ยงปลาเผา) is a similar idea, except instead of just ingredients and sweet syrup, grilled fish is added to the mix. When you order miang pla pao (เมี่ยงปลาเผา), you get the whole package, or called a chood (ชุด) in Thai. It included the grilled fish, a basket of leafy green vegetables, a platter of thinly sliced and diced accompanying toppings, and finally a selection of different sauces. Let’s begin with the fish. Without doubt, it was one of the freshest grilled fish I’ve had in a long time in Thailand, and both the taste and the texture of the fish made it obvious (and the fact that I had witnessed it being pulled out of the fish tank). The fish was incredibly flaky, firm, naturally sweet, and juicy. My mouth is watering just thinking about this fish. Definitely the freshness made all the difference. The accompanying toppings included (clockwise) shallots, pickled mustard greens, ginger, chilies, galangal, garlic, peanuts, lemongrass, eggplant, tomatoes, green banana, with some kanom jeen rice noodles and crispy pork rinds in the center. Not only did it look beautiful, but everything was fresh as well. The more leafy green vegetables in the basket included lettuce, wild betel leaves (this is the leaf typically associated with miang in Thailand), plus mint, Vietnamese coriander, sawtooth herb, and cilantro. 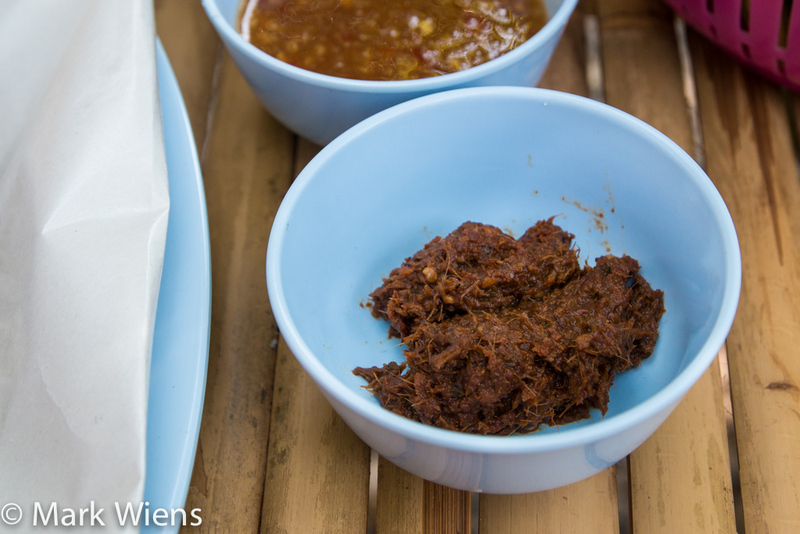 There were four different sauces served with our miang pla pao (เมี่ยงปลาเผา), a sweet tamarind sauce, a sauce that tasted like barbecue sauce to me, the classic sauce seafood (pictured above, which is the typical pla pao sauce (น้ำจิ้มซีฟู้ด) in Thailand), and finally a sauce made from pla ra (fermented fish sauce). The classic sauce, a mixture of chilies, garlic, fish sauce, lime juice, and a hint of sugar, was delicious. It was sour, garlicky, and just slightly sweet. But probably my favorite sauce of our meal was the pla ra bong sauce, a mixture of pungent fermented fish sauce, and actually, I’m not even sure what else was included. It’s definitely only for you if you love strong fishy flavors, and I loved it. How to eat miang pla pao (เมี่ยงปลาเผา)? 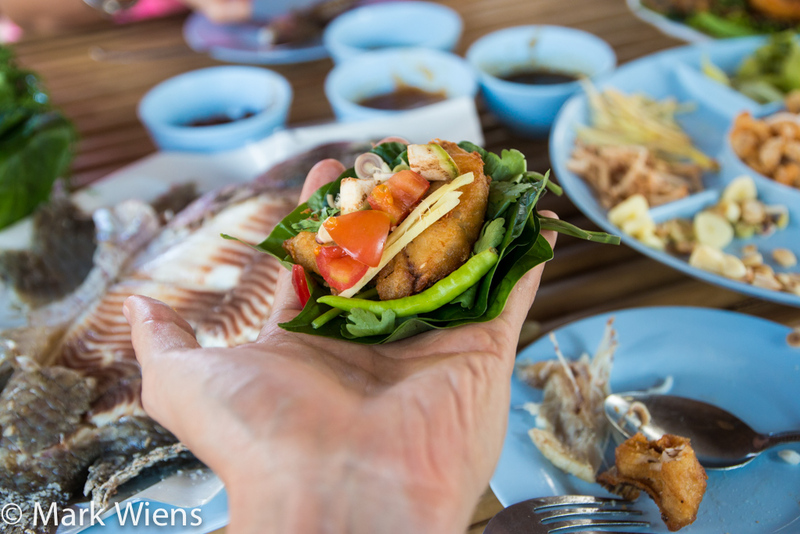 I was too busy eating my miang pla pao to take any photos of the assembling process (but I did make a video, coming soon), but during round two, with the fried fish, I had a chance to take a shot – and they are eaten the same way. First you take one of the bigger leaves, like lettuce, cabbage, or wild betel, then add in some fish, top it with whatever toppings you want, and finally douse it in your sauce of choice. You can either add sauce into your little leaf taco, or you can wrap it up and dip – either way is acceptable and both methods are equally effective – your choice. 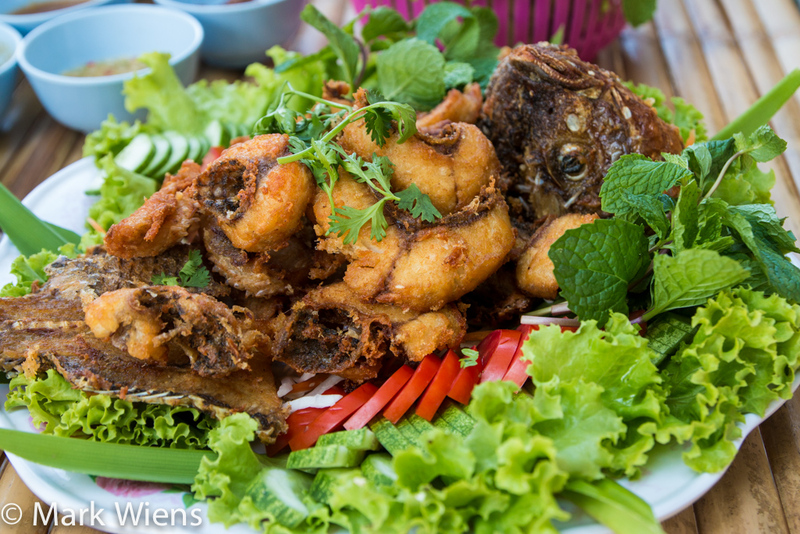 Another style of fish you’ll find at Udon Miang Pla Pao (อุดร เมี่ยงปลาเผา) is miang pla tod (เมี่ยงปลาทอด), the deep fried fish version. 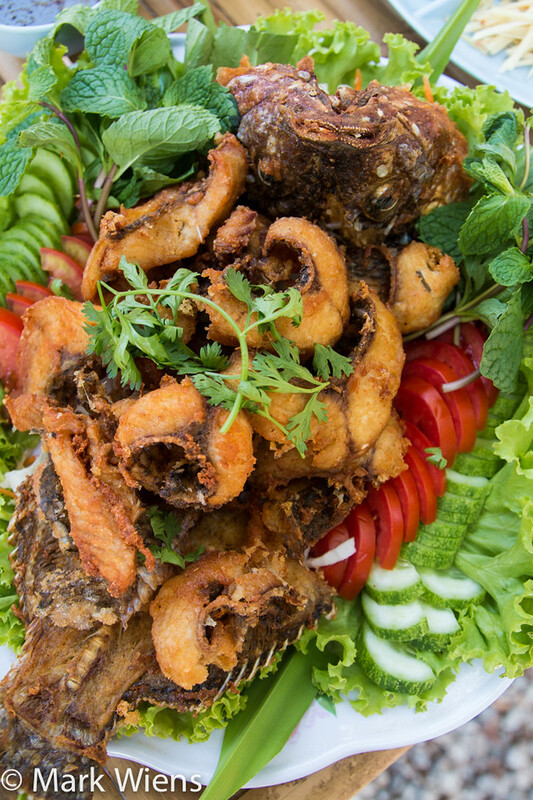 The fish, equally as fresh, appeared to be insided-out, deep fried to a crisp, and served on a plate garnished with all sorts of herbs and vegetables. 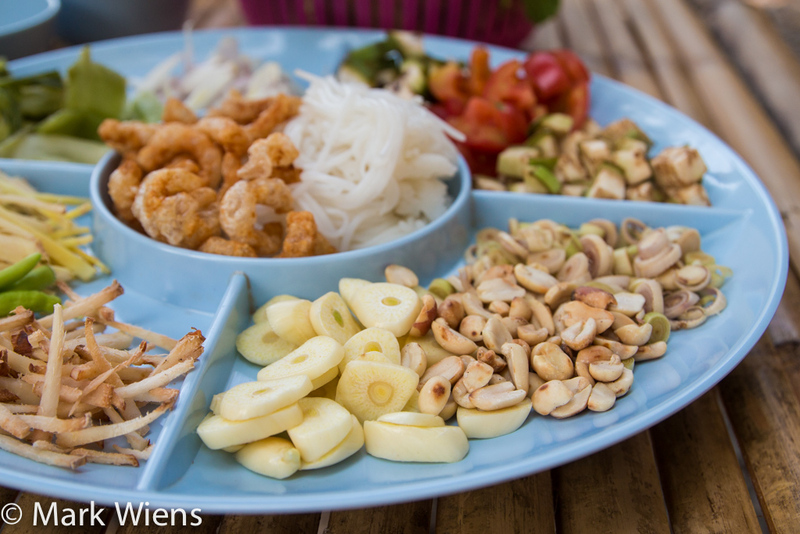 The miang pla tod (เมี่ยงปลาทอด) was served with all the same accompanying sauces and toppings. The fish was incredibly crispy, but drained well, and cooked in the perfect oil temperature so it wasn’t greasy. In comparison to the miang pla pao (เมี่ยงปลาเผา), the miang pla tod (เมี่ยงปลาทอด) had a much more crunchy texture, and less juicy. It was very good as well, and it was very fresh, but overall I preferred the juicy grilled fish. Finally, in Isaan a meal of just about anything would just not be right without including a plate of som tam(ส้มตำ) in the mix of dishes. This time, I got som tam ba (ส้มตำป่า), kind of a mixture of all things, dressed in fermented fish sauce, lots of chilies, and finally a sprinkle of crispy pork skin on top. You can’t go wrong with a plate of som tam (ส้มตำ), no mistakes here. 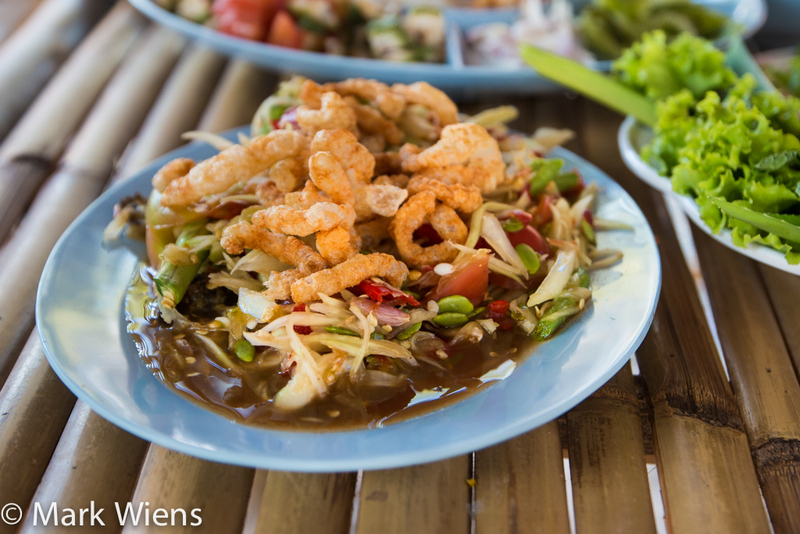 Udon Miang Pla Pao (อุดร เมี่ยงปลาเผา) is a restaurant in Udon Thani that specializes in miang pla pao (เมี่ยงปลาเผา), a dish of fresh grilled fish, served with raw vegetables, toppings, and sauces. The fish I ate was flaky and juicy, the variety of toppings were impressive, and the sauces were extremely flavorful. It was an incredibly satisfying and a healthy meal. 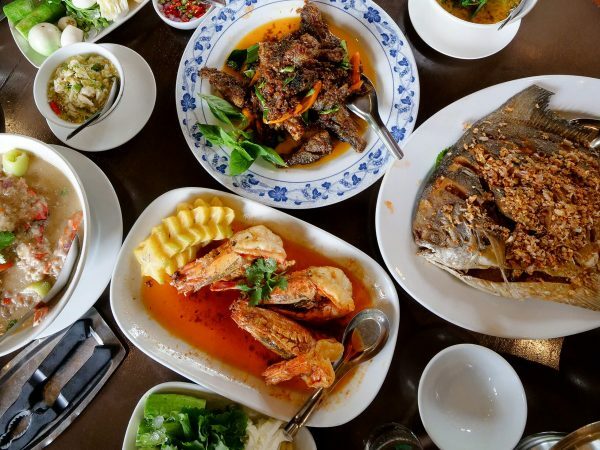 Along with the delicious fresh fish and beautiful assortment of accompanying toppings, the restaurant also has a lovely atmosphere, nice and relaxing. If you visit Udon Thani and are looking for excellent grilled fish, Udon Miang Pla Pao (อุดร เมี่ยงปลาเผา) is a spot you don’t want to miss. 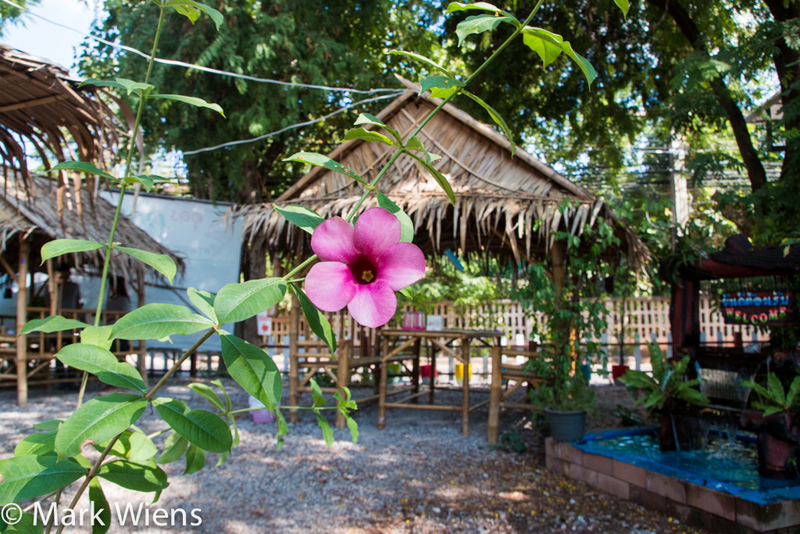 How to get there: The restaurant is located on the northern side of Nong Bua lake, along Phibun road – on Phibun, when you come to the Y intersection, go left. 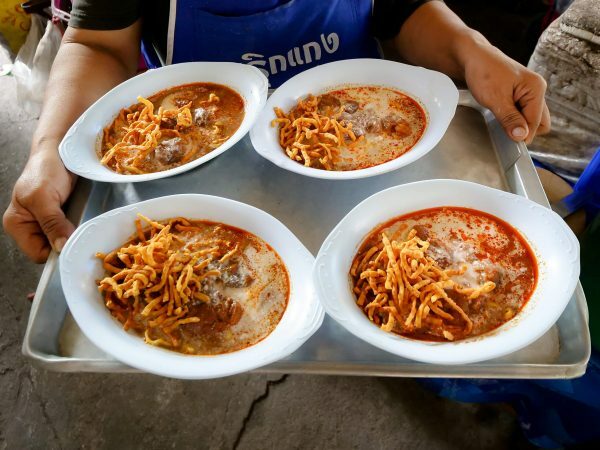 On the map, scroll down to Isaan, then click on Udon Miang Pla Pao (อุดร เมี่ยงปลาเผา), and it will highlight it on the map. Look at the texture of grilled fish. YUM !! Hey Kitti, yes it was extremely fresh, so flaky! Putting the Thai menu on the page is great as I can read Thai and it helps me practice Thai reading. Can you do that with all the places you go to? Your site is the best Thai food blog on the net, keep it up. Coming to Thailand soon, I’ll shout you and your wife a meal if you like, let me know. Hey Eric, got your surname removed. Cool, glad that you can read Thai and for the feedback. 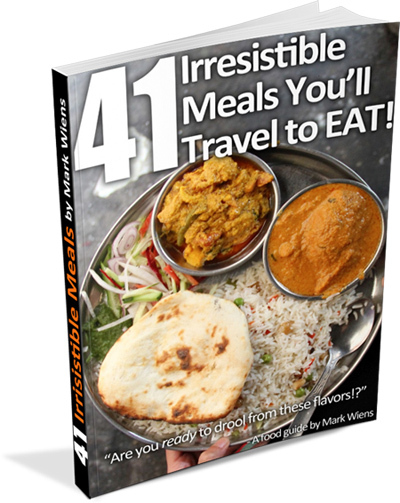 I’m going to start posting the menu on blog posts upcoming, glad that it’s helpful. How long will you be in Thailand? Thank you!